How do you launch a new podcast? 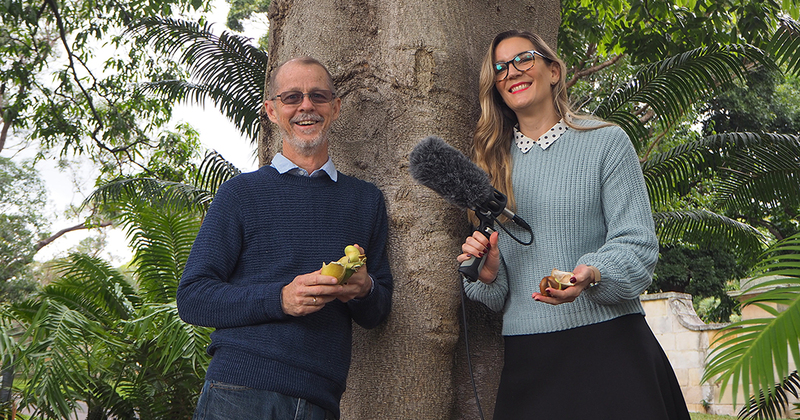 This year, the Royal Botanic Garden Sydney launched a podcast called Branch Out. It’s a fortnightly show that takes listeners on an audio adventure to discover the surprising world of plants with science and stories from Australia’s oldest living scientific institution. Branch Out has been a huge success. Since reaching fifth place in the ‘Science and Medicine’ category of the Apple Podcast charts, it has been featured by Apple Podcasts, achieved over 18,400 listens from around the world and has a five star-rating. The show has also been selected by Virgin Australia to feature in its in-flight entertainment. Science Communicator and Branch Out host Vanessa Fuchs explains how the show evolved. “Branch Out is all about bringing plants and the scientists who study them into the spotlight. It takes listeners into the lab and out into the Gardens where scientists are experimenting with new ways to solve some of the most critical challenges facing humanity today,” said Vanessa. Vanessa said that podcasting was the ideal platform to take a specialist topic to a much wider audience and help raise awareness of the Garden’s scientific work. “Not only does plant science matter in terms of sustaining life on Earth, it’s also a surprisingly fascinating and engaging topic. Plant science stories are made for a medium like podcasting that allows a deeper dive.” she said. “What we’ve tried to do with Branch Out, is to unlock the 200 years of stories we have here at the Gardens and beyond, but present it in a new and engaging way – podcasts like RadioLab were a huge inspiration for our concept. What skills do podcasters need? Vanessa has always loved audio storytelling – from being an avid Triple J Hack listener in her teens to co-producing and presenting on Brisbane’s radio 4ZZZ. However, before she joined the Royal Botanic Garden Sydney – she hadn’t made a real podcast before. The Gardens approached Miles Martignoni who produces podcasts for 2SER and The Guardian to train and prepare Vanessa for its new podcasting adventure. “Miles helped me plan the first five episodes and taught me all of the important foundational skills. From knowing what makes a good story, to what kind of microphone to use, to learning how to edit in Adobe audition – he gave me the best introduction to the podcasting world and the skills I needed to flourish,” said Vanessa. “One of the key things Miles showed me was how to make a seemingly dull or boring scene into something fast-paced and dynamic using music and switching between the audio and voice overs. If you listen to episode 2, ‘No Plants No Food’ you’ll know what I mean!” she added. The first five episodes in the series focus on building a connection between the importance of plants and everyday life with topics such as ‘No Plants No Medicine’ and ‘No Plants No Animals’. The show has continued to maintain a playful and engaging tone while also delving deeper into more technical topics such as seed-banking, pollination and genetics. On the horizon as the holiday season aproaches is a festive and surprising interview with Botanist Dr Russell Barrett. “What many people don’t know is that Australia is the real home of mistletoe and has over 90 different species. As far as plants go, mistletoes are quite remarkable because they rely exclusively on birds to spread their seeds. Stay tuned for the episode on Christmas Day to learn more awesome facts about these fiery, parasitic beauties,” said Vanessa. Vanessa’s work developing the Branch Out podcast led to her being a finalist in the 2018 Mumbrella ‘Content Maker’ award, which will be announced on Thursday 6 December 2018. We wish her all the best! Vanessa’s podcast making kit includes: Adobe Audition (part of the Adobe Creative Suite), a ZOOM H5 Handy Record, Beyerdynamic DT770 PRO – 250 ohms headphone, a music license with audio network, a Rode NTG3 shotgun microphone, a Rode PG2R Pistol Grip Shockmount and a Rode shockmount PG2-R windsock. Subscribe to Branch Out on your Apple or Android podcast app and check out the latest episode ‘bizaree bee-haviour & snotty gobbles.’ Help the podcast keep branching out by sharing it on your social media or by leaving a positive review in your podcast app. Thanks to Vanessa Fuchs for the interview and this image of her and Dr Brett Summerell, Director Science and Conservation at the Royal Botanic Garden Sydney.